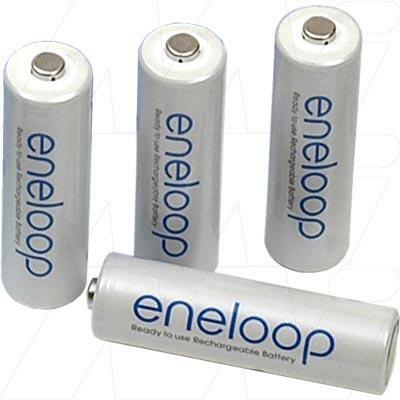 Eneloop was the world's first of a new type of consumer battery featuring very low self discharge which makes them ideal for virtually all situations where alkaline or lithium AA / AAA size batteries are currently used. Eneloop batteries offer the convenience of being ready to use straight out of the packet for up to one year before requiring recharging. Consumers can buy & use Eneloop batteries immediately & obtain a charger later on. Once capacity is used & the batteries have been recharged Eneloop battery capacity is approximately 85%* after 12 months storage & still 70%* after 3 years! This convenience plus the extra power of NiMH and the ability to recharge up to 1500 times makes Eneloop the 21st century battery offering greater run time plus vastly superior economy for use in the majority of devices accepting AA or AAA size batteries. You'll use hundreds of alkaline batteries just to match the overall life & performance of Eneloop batteries. Eneloop batteries can also be charged on most standard & fast chargers designed for NiMH batteries. Once an eneloop battery has reached end of life the battery is completely recycleable as is the packaging when purchasing eneloop.